Oldest of My Blood – Lois Abromitis Mackin, Ph.D. 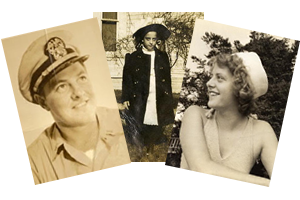 In my family, there were five of us—my parents married in 1950, and I was born the same year, in California, while my father, a serving naval officer, was deployed to Korea. My brother was born in 1955 in Annapolis, while my father was on the staff of the Naval Academy, and my sister was born in Rhode Island in 1958, while my father was executive officer of a radar picket ship in the North Atlantic. My mother was an only child, and my father had one sister, who married twice but had no children, so my siblings and I had no first cousins. All four of my grandparents were living when we were born, and we visited them often at their homes, both in Tamaqua (Schuylkill County), Pennsylvania, where my parents grew up, and at the vacation cottage on Lake Wallenpaupack built by my mother’s father in the 1930s. We continued in this way, following my father from duty station to duty station, with regular visits to my grandparents, until my mother’s mother, Mary Irene (Weaver) Neifert, passed away in Tamaqua in May, 1967. I was a junior in high school. My father had just returned from a Vietnam deployment and round-the-world cruise as commanding officer of a Navy destroyer, and my mother was single-parenting our family. The following year, in April, 1968, my father’s father, William Stephen Abromitis, was killed in an automobile accident in Pennsylvania. Dad was serving on an afloat staff (meaning that the staff was housed on an aircraft carrier instead of being based on land) off the coast of Vietnam. He was granted emergency leave for his father’s funeral, and our family traveled to meet him in Pennsylvania. Pop-Pop’s death coincided with Martin Luther King’s assassination, and the confluence of the television coverage of the King funeral while the funeral preparations for my grandfather were going on in my grandparents’ kitchen was pretty surreal. That summer my mother’s father winterized his lake cottage and moved there permanently, while my father’s mother remained in her home in Tamaqua. In the process of moving, Grandpa downsized a great deal of family memorabilia, including his wedding pictures. The family got smaller again in August, 1975, when my father passed away in Karachi, Pakistan, while stationed on another afloat staff. I was a graduate student and had just returned from my first dissertation research trip to England. Two years later, in 1977, I married, and in 1979 the family got bigger when my husband and I had our first child. Starting a family made me think a lot about my own family and my husband’s family. I was sad that my father wouldn’t have a chance to see my son, who was named after him, and that my son wouldn’t be able to meet his grandfather or two of his great-grandparents and learn about them and their lives. My husband (who was also a naval officer) and I were living in California, and I felt cut off from family. I was glad to be able to take little Will to Pennsylvania when he was about six months old to meet his two remaining great-grandparents. It was a good thing I did. My father’s mother, Julia Mary (Sakusky) Abromitis, passed away the following year, in September, 1980. Still in California, I wasn’t able to attend her funeral, and, unfortunately, my aunt did not preserve many family photos or other memorabilia when she cleared out Grandma’s house. Shortly after Grandma died, I became pregnant with my daughter. All those thoughts about family history and heritage came flooding back—not only was my father gone, both his parents were gone, leaving only distant relatives on his side of family. And, on my mother’s side, only my mother, my grandfather, and a few second cousins remained. The next loss was the last of my grandparents, Emerson Clinton Neifert, in April, 1990. By this time, my husband and I were living in the Washington, D.C. area with our school-aged son and daughter. This time we were able to attend the funeral and also show our children the town and houses where their great-grandparents lived. I was happy that my children were able to know my grandfather. Unfortunately, by the time they were of an age to really engage with him, he had become very deaf and a little demented, so they missed a lot. To her credit, my mother, Lois Irene (Neifert) Abromitis, captured and preserved the photos and documents from her parents and grandparents that survived Grandpa’s move to the cabin, and she also preserved much of her own and my father’s memorabilia. Unfortunately, she kept most of this material in her basement, where much of it was damaged by mold and dampness. It was when Mom passed, this past May of 2017, that I became the oldest of my blood. With Mom’s passing, I’m making it my mission to collect, digitize, and preserve the photos and documents we have about our family and share them with my siblings and children. I am grateful for what I have learned through the genealogy community about scanning and preserving historical resources, and I am happy that I have been able to learn as much as I have about my parents’ families. A very interesting read, Lois. I, too, am the oldest in my family of origin — the oldest of my parents’ three children. I have two cousins on my mother’s side who are older than I and one on my father’s side. I’m the oldest in my two paternal lines. Thanks to two cousins, almost all of the existing photos, genealogical notes from an aunt, scrapbooks, a book published by an ancestor, deeds to property, and other memorabilia came to me. I have almost nothing of my mother’s lines but I have a brilliant cousin (once removed) who has done wonderful research on them. I feel so very lucky.